As someone who is a registered owner or expressed an interest in Scenario Based Learning Interactive (SBLi), we are pleased to announce the release of the latest version of SBLi (v2). SBLi Builder is now free! The new release is freely available as a downloadable product for non-commercial educational use. Note licence fees are still charged for commercial use. Now supports 32bit and 64bit Windows operating systems. New assessment report option: A fill-in-the-blank(s) question type can now be inserted into a sentence or paragraph for the student to provide the missing word or words. New prerequisite functionality: Prerequisites have been significantly improved, providing much greater functionality that allows scenario authors to create more sophisticated and dynamic pathways. .
Free upgrade for existing licence holders. The new edition has been completely rewritten from the ground up and is a free upgrade! Supports IIS6/7 32bit or 64bit Windows server. Scenario Management Interface is now open source. This means large institutions can customise the Scenario Management interface and easily integrate the SBLi Server Manager within their own network environments and with other learning systems, such as Blackboard and Moodle. There is a new user-friendly interface with added functionality, security, improved search and enhanced Active Directory connectivity allowing organisations to integrate SBLi authentication with their existing network system. SBLi Server Player v2. This new version reflects the improved and added functionality of the SBLi Builder v2. For further information about SBLi and how it might help your teaching and learning activities contact us. Manchester University has been using SBLi since 2010.They also use Blackboard and have expressed a desire for more integration between the two. We have long recognised the advantages of integration to learning management systems (LMS) such as Blackboard or Moodle. To this end we have developed a number of additional web services to the SBLi Server software to cater for this. Since these additions Manchester University has recently announced they are developing an SBLi Blackboard Building Block. We'll post further updates as we hear more on their progress. Queensland Department of Environment and Resource Management, sees the benefit in problem based learning and has purchased an SBLi server and licence package. Following an SBLi training session they will be implementing SBLi online modules to assistance staff in keeping uptodate with various department procedures. The University of Queensland have elected to use SBLi to produce an Occupational Health and Safety Online Module, a requirement of the Enforceable Undertaking accepted by the University on 26 July 2010. This module will be required to be completed by undergraduate programs in Faculty of Health Sciences, Faculty of Science, Bachelor of Engineering and Engineering dual degrees, and School of Education. As part of the mandatory undertaking, this module will also be made available to all Australian Universities. HELP University have recently purchased an SBLi server and will be participating in a 5 day work shop to train their educators on SBLi. 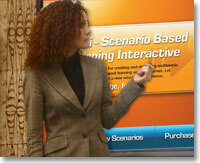 There intention is to use Scenario Based Learning modules for their core subjects. HELP University comprises a group of colleges which provide a wide and diverse range of programs covering business, law, management, economics, IT, social sciences and the humanities at undergraduate and graduate levels. In conjunction with the SBLi team, the Brisbane School of Distance Education (BSDE) is developing a scenario for Year 3 Geography students. The scenario focuses on Studies of Society and involves the students “traveling” around the world. The Open Educational Resource "OER" project with Genetic Analysis is now active and available free through Jorum. In Jorum Manchester University have made the scenarios freely available under the creative commons licence together with all the materials used for the building of the scenarios. Please feel free to download. As part of an Open Educational Resource project managed by the UK Centre for BioScience, colleagues at the University of Manchester have contributed five SBLi scenarios on genetic analysis. 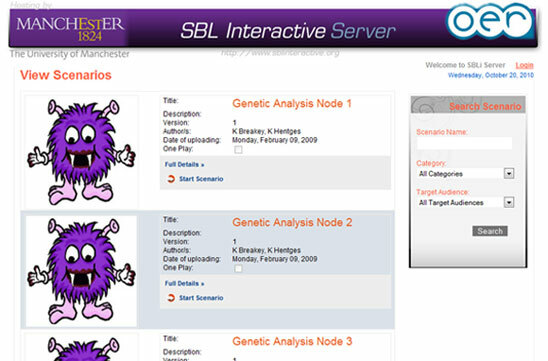 Throughout this series of scenarios students investigate the genetics of “Chocolate monsters” using SBLi functions to breed biotypes, analyse results and generally to provide an interactive learning module on principles of genetics. Preview of the 5 scenarios here. Teachers being able to select and edit an SBLi “resource”. They get a drop down box showing the scenarios they are authorized to use. Once a scenario has been selected an SBLi link is created on the page complete with icon. Students can click this link and a new window opens up into an SBLi scenario they are authorized to view. No login is required as Moodle knows who they are. If they are not authorized they get a message saying so. When a teacher clicks the link they go to a teacher’s page. From there they can view the scenario, view the logs and view the scenarios they are authorized to select. Teachers can hide the link from students and reveal it when they need to (and do all the other things Moodle lets you do with resource links). Access to the scenarios can be determined by Moodle groups the teacher might have divided the students into. The big advantage is that students and teachers require only ONE login…to their Moodle course. Terry intends to document the method and make it available to other Moodle users after further testing. Audrey Jinks regularly gives presentations on SBLi as part of UQ’s staff development program provided by UQ’s Teaching and Educational Development Institute (TEDI). Since it is not always possible for some staff to attend these regular staff development workshops, SBLi presentations and training workshops are often organised on an as needed basis. Sometimes SBLi presentations are provided in response to requests from specific Faculties and Schools. The latest presentation was to the School of Journalism and as a result, Anthony Frangi is interested in using SBLi to highlight some of the dangers that exist when journalists are investigating particular stories. If you have missed any presentations or training workshops, would like to organise an SBLi demonstration or would like to be included on the mailing list for any future training sessions, please contact Audrey (a.jinks@uq.edu.au). Terry Stewart from Massey University in New Zealand provided an update on the activities of the SBLi group at Massey. Geoff Crisp from Adelaide University talked about issues associated with assessment in the Web 2 environment. Click here for access to video clips and PowerPoint slides associated with these CoP presentations. A brief introduction by Audrey Jinks the SBLi co-ordinator; followed by each participant introducing themselves and their interest in SBLi. Geoff Norton the CBIT Associate Director - outlining recent news and events. Our guest speaker - Carl Sherwood, a UQ business statistics Lecturer, who gave a very interesting talk on the development of his scenarios. An informal discussion - where participants could share experiences and ask questions. The next CoP meeting will be on Thursday 28th January at 1.00pm - the main speaker will be Terry Stewart from Massey University, New Zealand. The title of his talk is – “SBL Interactive At The Coal Face: Experiences From Across The Ditch”. Further details will be provided in the New Year. SBLi will be a part of the Blended Learning Conference this Thursday June 18th. The Blended Learning Conference is in conjunction with UK's University of Hertfordshire. This two-day conference attracts delegates from across the globe who want to discover and share the innovations in blended learning which are happening in the UK and at higher education institutions around the world. For more UK based information click here for University of Queensland involvement click here. Learning Impact 2009 is IMS Global Learning Consortium's annual conference that brings together the world's leading creators, vendors, users, and buyers of learning technology to participate in program tracks focused on the latest innovations in learning systems, digital learning content, the learning enterprise, and open technologies. Presenters answer a key challenge question designed to inform the attendees on the state of innovation and best practices. The Learning Impact Awards are designed to recognize the most impactful use of technology worldwide in support of learning. This unique program evaluates established, new, and research efforts in context at an implementing learning institution. 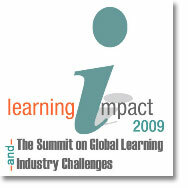 SBLi won a "Learning Impact Leadership Award" for Best Scenario-based Learning Toolkit. The University of Queensland has won a prestigious ASCILITE award using SBLi! At a recent meeting of the Australasian Society for Computers in Learning in Tertiary Education (ASCILITE), it was announced that a University of Queensland team, led by Associate Professor Catherine Lovelock, had won the small project category ASCILITE award for an SBLi scenario - "Habitat Change in Moreton Bay, A Field Study for Marine Scientists". This scenario, which is featured on the SBLi Homepage, involves students in a virtual marine field course, enabling them to learn the principles and techniques that they can apply subsequently to an actual field course. Click here for further information about this scenario and the ASCILITE 2008 conference.